Figurine retired – Discounted below cost! 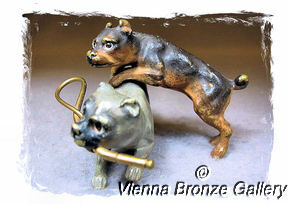 A fine cold painted Vienna or Wiener Bronze. Two cute pugs play billiard. The detail and expression of the bronze scene is great. And the condition is relatively good for the age of first quarter of 20th century. This is the last item of this character we have in our inventory. Thank you for having visited our site.